Since 1995 Line Skis have built some of the most fun skis on the market. They are one of the original and leading innovators in freeskiing. Throughout the years, Line has become well known for their twin-tip park skis, big mountain freestyle skis and more recently, their directional all mountain skis. Professional freeskier, remarkable artist and ski design extraordinaire, Eric Pollard is behind some of Lines most legendary big mountain freestyle designs. Eric Pollard is the shaper of Lines Sir Francis Bacon, Mordecai and Magnum Opus. In 2016 Line introduced his first directional ski, the Pescado. Radically different than anything else on the market, the Pescado has a super wide 158mm tip, 125mm waist and most notably a swallow tail. The Pescado is a total powderhound that has a ride as unique as its appearance. The swallow tail is designed to sink into powder and work with the wide tip to keep the front of the ski on top of powder, no matter how fluffy and bottomless the conditions may be. While the Pescado, with plenty of camber underfoot carves groomers well for a ski of its girth, it generally stays home for low tide days and rarely makes an appearance on the east coast. This year Pollard and Line came up with the visually stunning Sakana. The Sakana shares a few key features with the Pescado that make it a supreme ski for powder. The Sakana has a narrower but still very wide 150mm tip that planes up in deep snow. It also uses Lines Partly Cloudy Core (Paulowina and Maple) to keep the ski incredibly lightweight. This keeps the Sakana playful, maneuverable and above all (pun intended) on top of the snow. The most obvious similarity though, is the swallow tail which sinks to keep the tips up in powder. What Sets the Sakana Apart? What makes the Sakana new and different, is the all-mountain friendly 105mm waist, Carbon/Flax reinforcements to enhance responsiveness, increase stability and add energy to carves. The goal with the Sakana was to make another unique powder slayer, but make it even more versatile. While it looks like a big powder ski, a lot of its design features also help it through firm or variable snow. The swallow tail has no taper and extends the effective edge all the way to the very end of the ski allowing the Sakana to ski a bit longer than its measured length (so we recommend sizing down). Line uses a bit of rocker and minimal taper in the tip of the ski and plenty of camber underfoot to aid in the Sakanas’ edgeability. The wide tip really engages the snow and pulls the rest of the ski into the turn and a strong tail finishes the turn with a pop. While this isn’t a crudbusting tank because of its weight, the wide tip also helps the ski get up and over crud and variable snow. All of this carving talk shouldn’t scare away people who are looking for a playful ski. The Sakana is very easy to smear, pivot and hop around on thanks to its friendly, yet supportive flex and lightweight construction. It is a ski that could easily be used on most days out west and deeper days out east by someone wanting a fun and unique ride. Don’t wait too long to get your hands (and feet) on the Sakana. 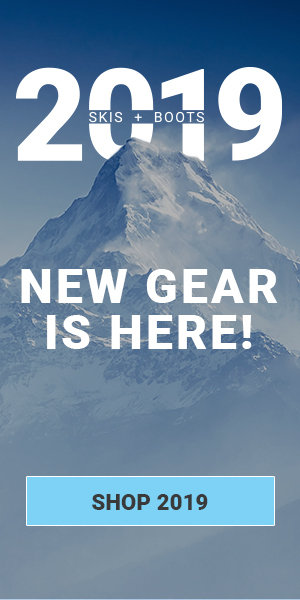 It was recognized by Freeskier at the 2018 Outdoor Retailer show as a standout. It earned “Best of Show” from them for being a visual work of art and awesome fun on the snow. The Line Sakana is a ski that is as fun as it is unique and is sure to receive more accolades this ski season. Check out our full review of the Line Sakana and as always visit us at Skis.com for buying guides, on-snow video reviews and more. And don’t forget to subscribe to our blog below to follow the latest in on all things skiing.